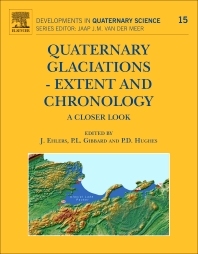 The book presents an up-to-date, detailed overview of the Quaternary glaciations all over the world, not only with regard to stratigraphy but also with regard to major glacial landforms and the extent of the respective ice sheets. The locations of key sites are included. The information is presented in digital, uniformly prepared maps which can be used in a Geographical Information System (GIS) such as ArcView or ArcGIS. The accompanying text supplies the information on how the data were obtained (geomorphology, geological mapping, air photograph evaluation, satellite imagery), how the features were dated (14C, TL, relative stratigraphy) and how reliable they are supposed to be. All references to the underlying basic publications are included. Where controversial interpretations are possible e.g. in Siberia or Tibet, this is pointed out. As a result, the information on Quaternary glaciations worldwide will be much improved and supplied in a uniform digital format.